Even though we recommend all of the products above, we do have our favorites. 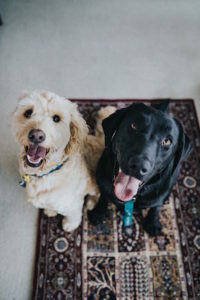 And with any dog flea and tick products used on our beloved pets, it’s important to consult your vet should you have any questions or concerns regarding the use of any product for your dog. Below are more detailed reviews of a few of the products we recommend above. And for a quick and easy glance, note the star rating of each dog flea and tick collar. 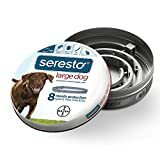 The Bayer Seresto Flea & Tick Collar for large Dogs is a best seller at most online stores and pet stores. It is made by the Bayer corporation, who also manufactures the chemical used in many other dog flea and tick collars. It is also one of the more expensive collars compared to others. The manufacturer claims that it is effective for 8 months. Unlike many of the other collars, we detected no smell once opening the package. We also agree with others about the quality of this product and that it’s one of the best 8 month flea collars. So we give the Bayer Seresto Flea and Tick Collar for Dogs our highest exclusive rating of FIVE STARS. The Adams Flea and Tick Collar for Dogs and Puppies is a one-size fits all, cut to size gray collar. This review is for the two pack product. The active ingredient is Deltamethrin, an insecticide belonging to the pyrethroid family. Pyrethroids are the man-made versions of pyrethrins, natural insecticides from chrysanthemum flower. The collar is water resistant. 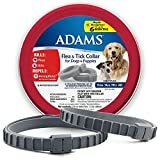 We give the Adams Flea and Tick Collar for Dogs and Puppies product FOUR STARS. 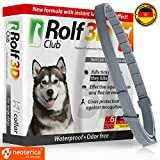 The Rolf Club 3D Flea Collar for Dogs comes in three different lengths; 15.6 inches, 25.4 inches and for large dogs, 29.5 inches. The product is imported and made in Germany. It has an exclusive formula that results in a 6 month effective length of time and is waterproof. The product by Rolf is effective against fleas, their larvae, ticks and mosquitoes. Somewhat strong collar odor at first, but quickly goes away. We think this is one of the best 6 month products out there and give the Rolf Club 3D FLEA Collar for Dogs our best FIVE STAR ranking!. When reviewing products, remember to compare the length of effectiveness to the price of the product. Also be aware of any reported odors or problems with the length and/or clasp of the collar. 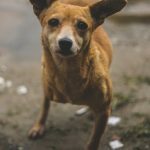 Do Flea Collars Have Side Effects? Most dogs will not show any side-effects from wearing protection from flea and ticks. 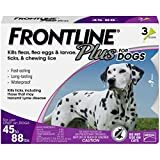 However, most commercial products that aid in protection from fleas and ticks do contain insecticides or other chemicals as the active ingredient. 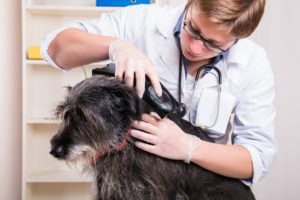 They work by exuding the drugs or chemicals into the hair follicles and glands of your dog’s neck and upper back. This moves or kills the fleas and ticks from the dog’s upper neck, ears, and neck to lower parts of your dogs body. They will, in most cases, then either fall off or die. 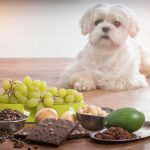 However, in some cases, your dog may have an allergic reaction. This is usually caused by an allergy reaction to one or more of the chemicals contained within the collar. Should this happen, it’s very important to remove it immediately and take your pet to your vet as soon as possible. Less severe side-effects usually involve the area around the newly placed collar. These potential side effects may include the dog scratching or itching, as well as possible hair loss or redness. 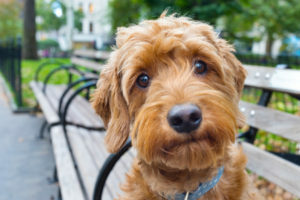 It is important to continue to watch and observe your pet to make sure these side-effects are not the beginnings of a more severe allergic reaction. 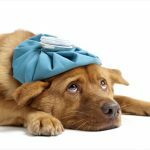 Should your dog exhibit any unusual side-effects, you should take them to your vet as soon as possible. What Are Dog Flea Collars Made Of? A flea and tick prevention collar is made from plastic that’s been mixed with pesticide with the end result being a strip that can be fastened around the dog’s neck. The collar should be loose enough to fit two fingers inside of it, but no looser than that. (Owners should cut off any excess as they’re typically made to be one-size-fits-all.) 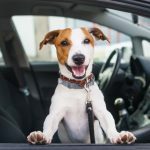 Every flea prevention product is different in terms of how long they last, but they’re generally effective for several months or more. While manufacturers swear up and down that collars are perfectly safe for any pup out there, some people find the idea of exposing their dogs to chemicals unsettling. A natural flea prevention collar may work. 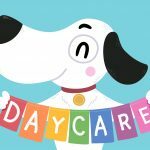 The benefits are that it’s less expensive and a more natural choice for a dog. All an owner needs is a collar or bandana, cedar or lavender oil, and water. Once the mixture has been applied and rubbed into the collar, it can be placed on the dog to repel fleas and ticks. 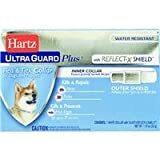 Owners can also use this mixture on the dog’s tail to keep the dog’s body entirely protected. The mixture will typically need to be applied every week to get the best results.